Here is an antique lace trim with repeating flowers outlined with shiny thread along the flowers & scrolls (yardage 6 yards x 1"). The antique insertion lace trim has a straight edge at the top & bottom of the lace. 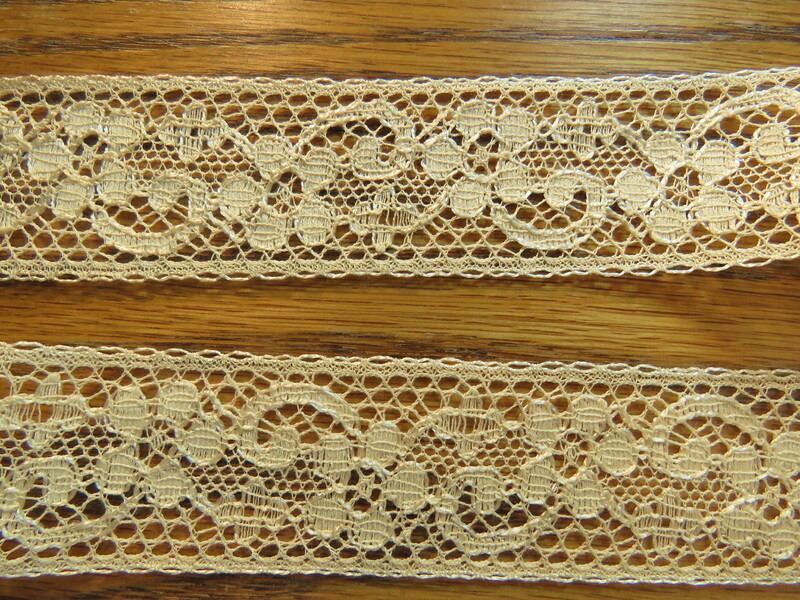 Antique Lace Trim Measurement: 6 yards long x 1"
Material: Cotton. 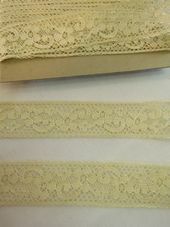 Color: champagne yellow (see photos against white paper) Antique Lace Trim Condition: The antique lace trim is in very good unused condition. The top edge of the lace that has been exposed to air has darkened & the lace will need to be washed by the buyer. A few stray threads within the available lace (see photos). This lace trim is from the estate of a French seamstress who was a doll collector.